Trainers who want to earn one of Pokemon Go's most sought-after items will need to prepare for battle. The most recently-announced update for Pokemon Go does more than just tweak gym several functions -- it also adds the game's new Raid Battles in addition to several exclusive new items. Chief among the list of new items in the Pokemon Go gym overhaul update is the Golden Razz Berry, a succulent treat that is able to restore a Pokemon's motivation as well as reduce the difficulty in capturing wild Pokemon, which will surely make it one of the most sought-after items in the game. Understandably, the new Golden Razz Berries won't be easy to come by, but dedicated players shouldn't have much trouble tracking them down. Read on to discover how to earn Golden Razz Berries in Pokemon Go. 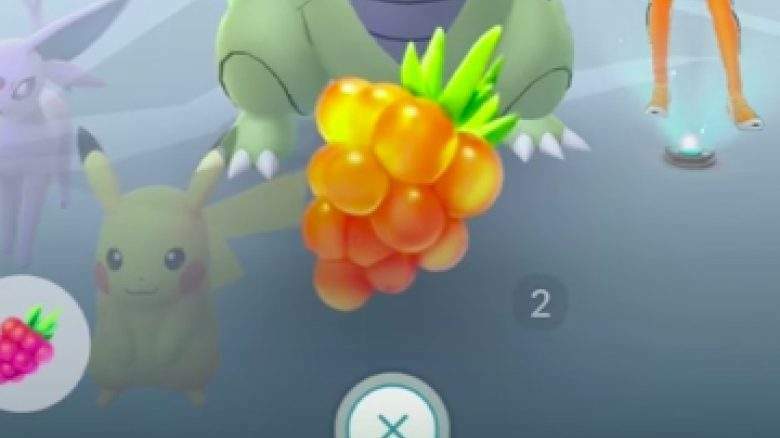 Since the primary use of Golden Razz Berries is to restore a Pokemon's motivation meter, it makes sense that the primary way of unlocking them is through Raid Battles. Raid Battles, Golden Razz Berries, and the motivation statistic were all introduced with the recently-released gym overhaul update, so there's little surprise that they all work together. Players who want to earn Golden Razz Berries will need to fight and win some of the game's Raid Battles. While there's no guarantee that Golden Razz Berries will drop after a successful Raid Battle, the fine folks over at the Pokemon Go-based Silph Road subreddit have put together a Google document examining the drop rates for various rewards at different gym tier rates. The results are fairly straightforward: trainers who win a Tier 1 raid battle had a 75% chance of unlocking a Golden Razz Berry and a 78% chance of unlocking a Rare Candy. Tier 2 Raid Battle participants reported a 78% chance of earning a Golden Razz Berry and 80% chance of earning Rare Candy, and these numbers continue to rise to 87% and 82% for Tier 3 as well as 90% and 88% for Tier 4. It's also worth mentioning that all tiers had a small chance of unlocking Pokemon Go's new Technical Machine, starting at an 11% chance for Tier 1 and soaring up to a 64% chance for Tier 4. It goes without saying that these are immense rewards for Pokemon Go fans. Golden Razz Berries work for players who prefer to control gyms as well as those who like seeking out new creatures, and the newly-released Technical Machines are able to transform strategies by teaching Pokemon new moves. Using both items, Pokemon Trainers will be well on their way to tackling bigger and badder challenges. Pokemon Go isn't the only hot free-to-play title for Android devices. To discover more, head on over to our exclusive list of the Best Android Games.